So there we were, poring over earnings releases and annual reports, because that’s what we do around here in our spare time, when we came upon Alaska Air Group ($ALK). That’s when we noticed: the company’s earnings release for full-year 2017 results, filed on Jan. 25, 2018, proudly said net income was $1.028 billion, up 26.3 percent from the prior year. But wait! On the full 10-K that Alaska Air filed on Feb. 15, it listed net income as $1.034 billion — $6 million more than the number it reported just 21 days earlier. What happened? Take a look at how Alaska Air reconciled its non-GAAP net income on the earnings statement (at right), compared to its full income statement filed in the 10-K (at left). Look closely. Do you see it? The “special tax (benefit)/expense” in the earnings release was reported as a $274 million benefit, but that number changed to $280 million by the time the 10-K was filed. That explains the $6 million increase in net income. According to a footnote in the earnings release, the benefit arose from remeasuring deferred tax liabilities after Congress passed the corporate tax cut in 2017. Apparently that remeasurement was adjusted by the time the Form 10-K was filed. That is legal; numbers in earnings releases don’t have any liability attached to them and aren’t audited, and the amount isn’t material anyway. Still, our Alaska Air discovery did make us wonder: What other discrepancies do companies have between the 8-K earnings release and the 10-K annual report? Another good example comes from AmerisourceBergen ($ABC) and its results for fiscal 2017. When Amerisource filed its earnings release on Nov. 2, 2017, it clearly reported net income as $414.5 million. But in its Form 10-K, filed on Nov. 21, net income had dropped to $364.5 million — a decrease of $50 million, or 12 percent. Which is not an immaterial amount of money. Upon closer inspection, we can see that Amerisource increased its expense for employee severance and litigation by $50 million; that’s the cause of the net income discrepancy. If you compare footnote disclosures in the earnings release and the 10-K (folks, always read the footnotes), we can see the $50 million is specifically an increase in litigation settlements, from $864.4 million to $914.4 million. Then you can use our Interactive Disclosure page to pull up AmerisourceBergen’s discussion of legal matters and contingencies. It’s a long list, including subsidiaries tampering with syringes to dilute oncology medicines and pending opioid legislation. We didn’t do a sentence-by-sentence comparison to pinpoint exactly which legal troubles pushed up the settlement budget by $50 million, but any analyst following AmerisourceBergen could. That’s what Calcbench lets you do. And, as we can see from these two examples, analysts probably should, too. 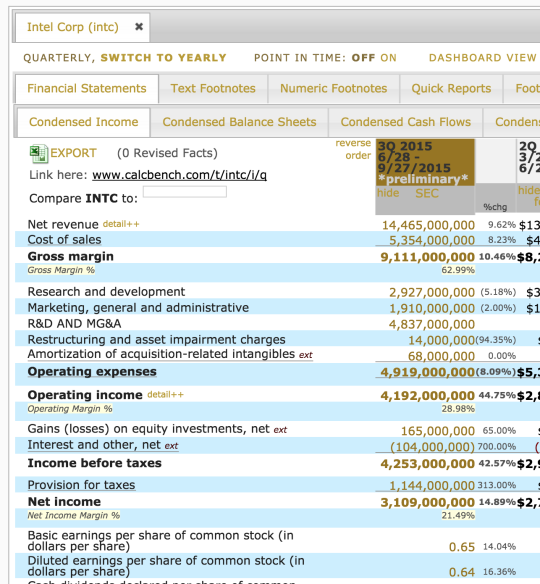 A lot can change between the earnings release and the 10-K.
Calcbench has been hot on the new accounting standard for operating leases lately, since the standard goes into effect on Dec. 15 and could have significant implications for companies that carry large operating lease obligations on their balance sheet. Now, if you want an example of just how significant those implications can be, look no further than rival shipping giants FedEx and UPS. We picked them because the two firms are roughly similar in revenue, net income, assets, and liabilities. FedEx, however, pursues a business model where it leases much more space than UPS does. The upshot: FedEx’s obligations for future lease payments are 11 times larger than those for UPS. Now, recall that the new lease accounting standard requires companies to report those future lease payment obligations as liabilities on the balance sheet; and to add a corresponding “right of use” asset on the asset side of the balance sheet too. Well, return on assets equals net income divided by total assets. So when you add items to the asset side of the balance sheet, you are expanding the denominator of that formula and your ROA must decline. It’s math. Take a look at this comparison of FedEx and UPS, all pulled from Calcbench data. We examined the companies’ current leasing obligations, added them to the liabilities side, and then added an equal amount to the asset side for the offsetting right-of-use asset. Then we recalculated an adjusted ROA according to the new leasing standard. This is the result: Two companies of similar size, but one (FedEx) experiencing a considerable change in ROA simply because of an accounting change, rather than some fundamental change in business operations. 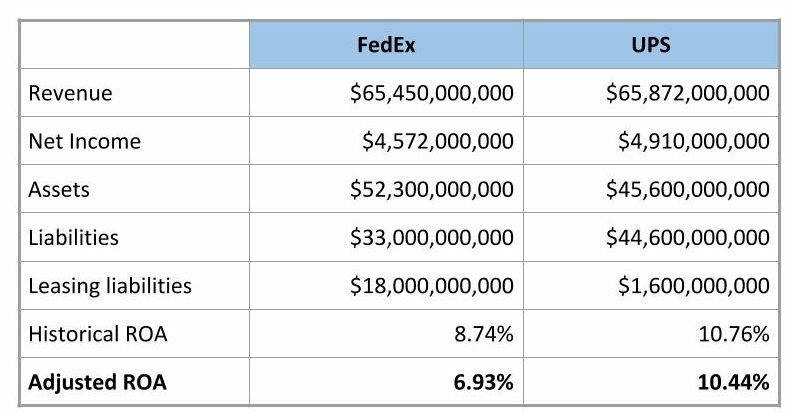 Financial analysts, therefore, might want to ask FedEx on its next earnings call: do you have any debt covenants that might be triggered when ROA falls below 7.5 or 7 percent? Do any executive compensation agreements tie to ROA? Anything else we should know about involving changes to ROA? You get the picture. (Like, literally; we supplied the picture three paragraphs above.) Calcbench can dig up the data you need. Whether you feed it into your own Excel models or just fiddle around on the fly, we have it. You can find it. Most public companies file with the SEC both an earnings press release (through a Form 8-K) and an annual report (Form 10-K). The timing of the annual report is determined by the company’s filer status. For example, a large accelerated filer (a public float of more than $700 million) needs to file its 10-K within 60 days of the fiscal year end. The timing of the 8-K, however, is determined primarily by the company. To file the 10-K the companies need their auditors’ approval, since the auditor’s letter is part of the filling. The earning press release does not require such approval. Following up on our previous post on the topic, we wanted to take another look at the timing of both the earnings press release (the 8-K) and the annual report (the 10-K). We examined all companies that have filed their 2017 annual report to date. We calculated average days from the fiscal year-end (FYE) to the filing of the 8-K and 10-K. We also calculate the percentage of time until the filing of the 8-K out of the total time until the filing of the 10-K. (For example, 100% would mean that both were filed on the same day). As can be seen from the table above, Large Accelerated Filers file their 10-K quicker than the other filers. That is no surprise; they are required to do so by law. What is interesting is that, relatively, they file their earnings press release more quickly than other filers. That is, they publish the 8-K quickly (41 days on average after the FYE) and then spend more time working on their 10-K. The delay between the 8-K and 10-K is smaller (relatively) for the other (smaller) filer categories. We wanted to take a closer look at the Large Accelerated Filers. 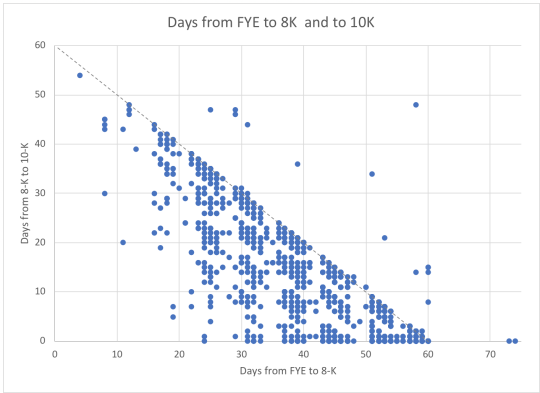 We charted the number of days from the FYE to the 8-K and from the 8-K to the 10-K. All companies should have been below the diagonal line (file the 10-K within 60 days), and the vast majority did. In general, the closer the company is to the origin, the faster it files. Conversely, the further from the origin (especially beyond the diagonal line), the longer it takes for them to file. What is interesting though, is the timing of the 8-K relative to the 10-K. Companies on the X axis filed both the 8-K and 10-K on the same day, whereas companies higher in the chart had more of a delay. We wanted to see whether the timing of the 10-K and delay between the 8-K and 10-K is associated with some other measures. We divided the Large Accelerated Filer to quartiles based on the days between the FYE and the filing of the 10-K.
We found that the companies that file the 10-K faster are larger and have less of a delay between the 8-K and the 10-K. This result may be a little surprising considering that larger companies are typically more complex and may require more time to prepare and audit the annual report. This result could, however, be driven by the market demand for information from the larger companies. First of all, keep an eye on our Recent Filings Page. You can see all of the press releases coming in today or a different day: www.calcbench.com/recentfilings. From there you can click to go directly to that press release in our financial statements viewer, or our interactive disclosure viewer. Pick a single company or group of companies you’re interested in (more about that here). 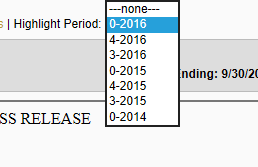 Otherwise, pick a period and year, OR pick ‘All History’ if you want to look at a company or companies over time. If there are full financial statements in a press release, we will merge that data with our existing financial statements for the company…in line-item detail as always! You can see this on the Company in Detail page for the particular company. In addition, we standardize some of the Non-GAAP metrics, Guidance, and Operating Metrics so you can see the history over time. You can find these standardized metrics in the metric explorer when you go to our Multi-Company page. Earnings Press Releases are the customary way for public companies to report highlights from a recently ended quarter to the press and public before they file their formal SEC filing. Not every company issues an earnings release, and the style and information contained by the press release will vary from company to company. In general earnings press releases take two forms: Preliminary and Standard, with some companies using both, and others just one or the other. A preliminary earnings release usually contains a small set of ‘preliminary’ (subject to change) financial results, like revenue and cash flow, often times heavily rounded or presented in ranges. This is to give investors a quick overview of the quarter just ended even while the final numbers are still being double checked. A standard earnings release on the other hand will normally contain ‘final’ numbers presented in greater detail. 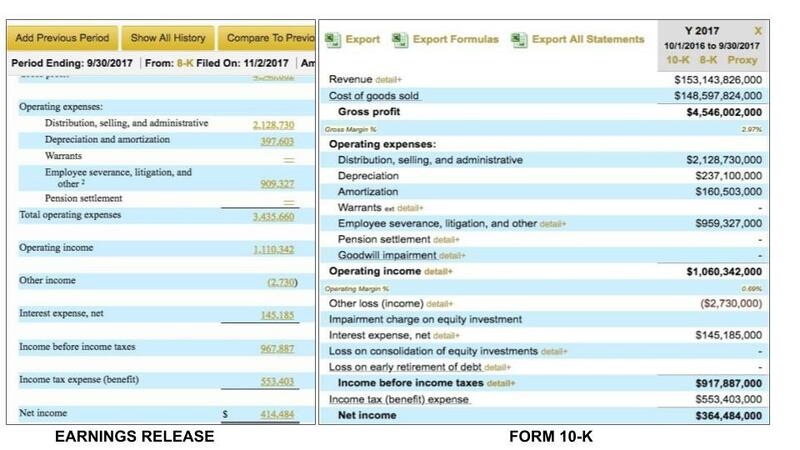 The majority of companies include at least a full income statement. Many will contain a balance sheet and even cash flow statement as well. 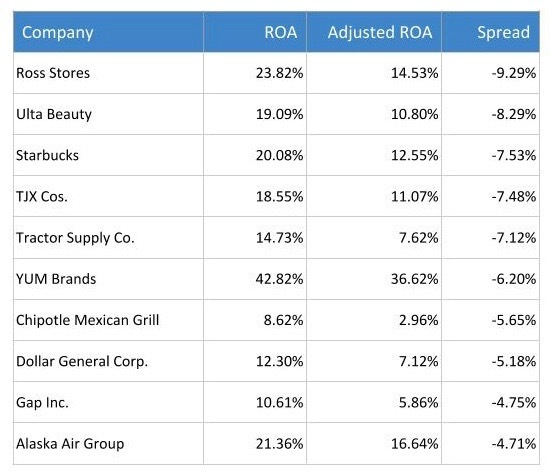 These ‘adjusted’ metrics are the companies’ attempt to tell their story on their own terms. 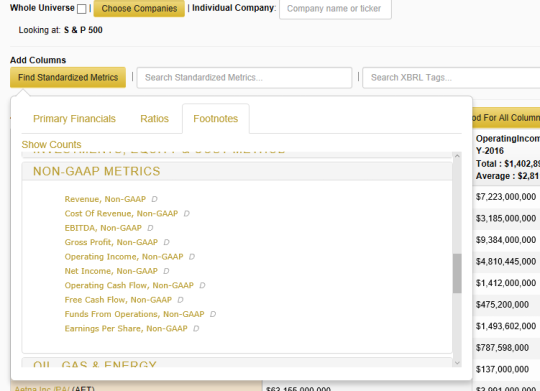 These metrics are derived from ‘official’ GAAP numbers, but include adjustments in order to help analysts better understand the company’s results. This often involves removing ‘non-recurring’ items like restructuring costs, or non-cash items like share based compensation. The running joke of course is that these adjustments almost always end up making the company look far better off than the GAAP numbers would suggest. For this reason regulators have been taking pains recently to make more rules about what is and is not appropriate. However, you should always use them with at least some skepticism. All non-GAAP financial metrics must include a reconciling table to show how they were calculated. This will usually appear near the bottom of the release. Many companies provide future predictions about their expected performance. They will choose a few metrics and give an approximation of what they expect for the coming quarter and/or coming year. Looking at the company’s past actual performance as compared to its past guidance estimates can give you an idea how well you can trust their current predictions. Some companies have a history of under promising, which means they try to ‘guide low’ and then ‘beat’ each quarter. Other companies try to hit their guidance exactly. Guidance will sometimes be updated as the period goes on and new information is available. Companies are required to make public to everyone any new information they give to anyone about their financial standing and predictions, and generally must also file a copy of this information with the SEC in the form of an 8-K.
For example, Monthly Active Users, Backlog/Bookings, Comparable Store Sales, Customer ‘Churn’, and others. These are additional metrics that add more detail about the company’s performance. These items may seem straightforward, but always remember there are no strict definitions that apply across all companies. So, one company’s churn calculation may differ from another’s, for example, making them incomparable. If you are using these metrics to compare one company to another, make sure you check the definitions. Next Up…How to use Calcbench to Research Earnings Releases. Also, Click here to download our full Earnings Release Analysis Guide. 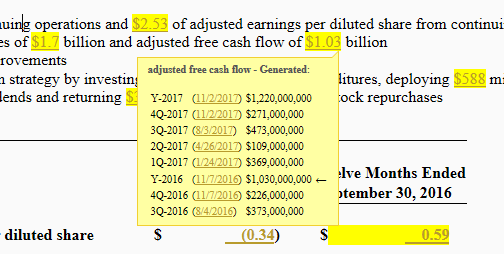 Now you can click on numbers in 10-K/Qs and Earnings Press Releases to instantly insert Calcbench formulas directly into Excel. You can use this to build a model based on face financials or footnotes to the financials in minutes. 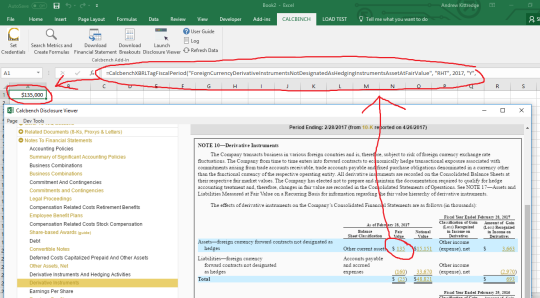 The Company-Detail and Multi-Company pages are also rigged up for click-to-insert-formula. 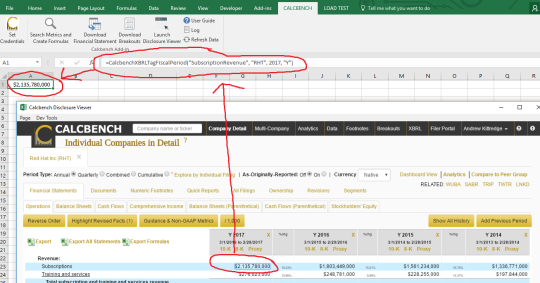 If you open the Company-Detail page in the Disclosure Viewer window you can click on the numbers in the face statements to insert formulas. If you need to enter a bunch of numbers from 10-K/Qs into Excel quickly sign up for a Calcbench trial @ https://www.calcbench.com/join and download the Excel Add-in @ https://www.calcbench.com/home/exceladdin. Now Available: Our Operating Lease Report! Our latest look at operating lease expenses is available on the Calcbench Research page. For financial analysts or anyone else following the telecom, consumer, or utilities sector, you may want to take a close look. Those three sectors have the highest average leasing liability currently off the balance sheet—which a new accounting standard, going into effect in 2018, will put on the balance sheet, for the first time ever. Some companies, and the investors who follow them, may be in for a jolting experience. And for those of you following companies in other sectors, don’t worry. The new standard will probably be a jolting experience for you, too. The standard is known by a few names: ASU 2016-02, ASC 842, or its plain old English language name, “Leases.” It goes into effect for reporting periods ending on or after Dec. 15, 2018, so companies have less than 18 months left to (1) calculate the effect of the new standard on their financial reporting; (2) make any adjustments to internal controls, financial processes, or debt covenants as necessary; and (3) communicate to investors about what’s going on. Right now, operating lease expenses are only reported in the footnotes. Companies typically disclose leasing costs in each of their next five fiscal years, plus all other “future years,” with a total exposure summed up at the bottom. The four companies with the largest total leasing liabilities were AT&T ($23.1 billion), Walgreens-Boots Alliance ($22.8 billion), CVS Health ($18.1 billion), and Verizon ($14.4 billion). We also compared those off-balance sheet leasing liabilities to liabilities already listed on the balance sheet—and yes, for more than a few companies, complying with ASC 842 will cause their total liabilities to balloon. Potbelly Corp.’s total liabilities would increase by 469 percent, Chipotle Mexican Grill’s by 367 percent. Our research report has a list of the 25 firms facing the biggest spikes in total liabilities. The report also has two specific examples of how companies are reporting their lease liabilities now, and how that’s likely to change come December 2018. We’ll be following the leasing standard closely in coming months, including the disclosures companies make about how their implementation plans are proceeding. For now, you can get the full report— or any of our other insightful reports on financial reporting issues—on our Research page. Corporate filers and financial analysts, prepare yourselves: the next big change in financial accounting has pushed off the docks and is sailing to a balance sheet near you. The change is a new lease accounting standard, adopted by the Financial Accounting Standards Board in February. The standard directs companies to report the cost of all leases on the balance sheet for the life of the asset, whether that asset is office equipment, real estate, vehicles, or anything else with a lease attached to it. The update does not go into full effect until 2019, but since companies will need to present three years’ worth of financial data retrospectively, you should prepare to panic starting with your 2017 fiscal year. If you want to do more sophisticated analysis of leasing costs yourself, you can start with our Calcbench Operating & Capital Lease Disclosure Overview. That document explains how to use our database platform to find and study leasing disclosures, and how to use our Excel add-in if you want to export the data to your own templates. The good news about the standard: the accounting and reporting legwork involved (that is, moving your disclosure from footnote to balance sheet) shouldn’t be too hard unto itself. The consequences of putting lease costs on the balance sheet, however, are where things might get tricky. For example, companies will want to review whether their new asset and liability numbers have any effect on debt covenants, or on earnings per share. We also have that pesky fundamental equation of financial reporting: Assets = Liabilities + Shareholder Equity. So if your liabilities rise because of all these new leasing costs, either shareholder equity will fall, or you will need to increase assets by an equal amount. As seen above, that equal amount might be quite large. You have concerns beyond simple balance sheet reporting, too. Audit firms might question the strength of your internal controls around leasing, to confirm that you capture all lease data promptly and accurately. If your business has lots of vendor service agreements, you will want to see whether those agreements include the leasing of equipment as part of the deal; that will need to be reported. Those questions about operations are beyond the scope of what Calcbench addresses, but corporate finance executives should have no illusions—you’ll be answering those questions soon enough. Meanwhile we do have a few other materials you might find useful. At Calcbench we specialize in analyzing ‘interactive’ SEC filings…filings that are tagged using the machine readable XBRL format. These filings largely consist of annual and quarterly reports from most every company traded in the U.S. However, a common criticism of the SEC’s XBRL system is that earnings press releases are not required to be tagged in XBRL. These press releases are documents that give an overview of a company’s results for the period, and they often come out days or even weeks before the full quarterly or annual report. This means that people relying on interactive data often times have to wait a little while to get financial information that has already been released by the company. We’re working to change that. Starting this month we are incorporating non-interactive data from earnings press releases into our platform. To start, we’ll be displaying press release data in our Company in Detail page. You’ll see it marked as ‘Preliminary’, because it is not from a formal XBRL document. When the 10-K or Q arrives, the preliminary column will be replaced with the complete interactive data. If you don’t have a login, just sign up HERE! One of the most enlightening aspects of financial statement analysis is in examining the footnotes of firms. Calcbench set out to systematically analyze the off-balance sheet debt of US firms by first looking at the commitments that these firms have made in their leasing obligations (report here) . What we found was eye-opening. First, the idea that a firm will lease assets is nothing more than a financing decision. A lease gives the lessee, the right to use an asset (e.g. store, computer or vehicle) for a specified term and expense. Since the lessee does not assume the risk of ownership, the lease does not have to be put onto the balance sheet. In many cases, this simple action may distort the assets and liabilities of the underlying firm. So we asked a few simple questions. 1. What would balance sheets look like if operating leases were put back onto the balance sheet? 2. Which firms / sectors will be most effected? 3. How have these obligations changed over time? Our results are summarized in the Operating Lease Report on our website. Please download it and have a look for yourself. But, here are some highlights. Retail trade and Manufacturing have the largest estimated liabilities in the S&P500. This is not unexpected as they have large property, plant and equipment obligations. What was surprising to us was in the firm level observations. It appears that in several cases in the retail sector, the off-balance sheet lease obligations are of significant size. In a few cases, they are 1 or 2 times the size of the 2014 Total Liabilities of the firm! In over 50 specific firms off balance sheet operating leases represent more than 15% of the outstanding liabilities!! All of this would not be possible without extensible Business Reporting Language (XBRL). Last week we began our series of Analysis Guides with a piece on Analyzing Tax Disclosures in financial statements. This week we continued it with a Lease Template example. This post is a meant to serve as a primer on what our customers can do with the lease template. Enable the macros and connect to Calcbench. Next (assuming you pick the lease template), select a firm by putting the symbol into the cell B3. You can also change the year in B4 and the Assumed Interest Rate in B5. Once you have done the above, you will see that the Present Value of Lease Liabilities (PVLL) is calculated on an annual basis for you. In addition you will get the Interest Expense, Depreciation and Tax Deduction calculated. On the far right in cell I20, you will get the estimated amount that would be placed onto the liabilities side of the balance sheet. We also provide you with our Lease Ratio, which simply takes the PVLL and divides it by Current Liabilities and Total Liabilities. Finally, we estimate the PPE increase that is implied if Shareholders Equity were to stay constant for the firm in question. Since, we are data scientists, we decided to build a macro based on our template and run this spreadsheet for the S&P 500 constituents for 2013 and 2014. The graph below shows the change in lease Liabilities on a year over year basis for firms that have reported both 2014 and 2013 results so far (through today, 2/19/15). You might interpret increases in Lease Liabilities as confidence, or perhaps not. Also attached are the Implied Lease years for each of the firms. This is an imputed, or estimated, number based on the dollar amounts beyond the standard 5 year lease reporting period and current leasing behavior. As you see, Whole Foods, Costco and Chipotle report the most dollars committed to the future. Family Dollar is the biggest YoY increase (percentage wise) and this is before the Dollar tree merger! Implied Lease Years. E.G. Whole Foods at over 17 years (first 5 reported + 12 implied)! #Confident.